Paulie, the Penguin - monemades Webseite! Issue 54 of the Knit Now magazine is available at the newsstands today and I am happy to share my pattern in this issue with you: my penguin socks. This pattern was in my mind ever since I got a Christmas gift year ago – mind you, I can hardly recall what the gift was, but it was wrapped in pretty paper with a print that looked like stranded knitting. 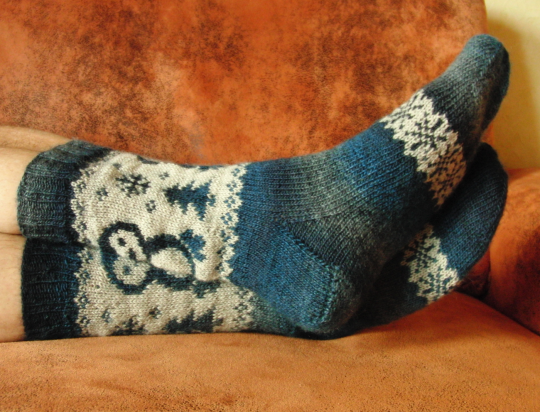 One of the motifs was a penguin… so cute that I knew right away I had to create a motif like that for socks. During the design process I always called the project my ‘Paulie socks’, although I have no idea why in my mind penguins are always called ‘Paul’… Anyway, say hello to ‘Paul the Penguin’. I like the Christmassy colours chosen for the sample in Knit Now, although the socks look just as cute in different colours. Here’s my prototype, which I think turned out really nice, knit in a blue gradient yarn and a light grey.